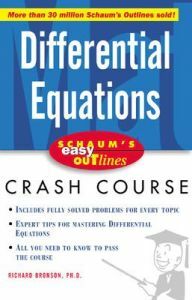 "Easy Outlines" are concise, easy-to-use versions of the biggest and best-selling classics in the Schaum's "Outlines" series. This is a continuation of the Schaum's "Easy Outline" series, successfully launched in 1999. The annual enrollment in Differential Equations is 100,000. Every book in the series is a pared-down, simplified, and tightly-focused version of a top-selling Schaum's "Outline". In the aggregate, these titles have sold more than 4,000,000 copies. Format will be streamlined and updated for a contemporary look and feel. Each book will extract the absolute essence of the subject, presenting it in concise and readily understandable form, emphasizing clarity and brevity. Graphic elements like sidebars, reader-alert icons, and boxed highlights will feature selected points from the text, emphasizing keys to learning and giving students quick pointers to the essentials.